You can see things with your eyes. But you can see too with ‘your mind’s eyes’: your imagination. It’s even possible to draw (or paint) things you see in your imagination. I have different ways to make such drawings. About two of those I tell you this time. The first way. I want to tell a story in a picture. In this case the story is about an animal. It’s a real, existing animal. But I want to show something about the animal that can’t be seen in a photograph. The first drawing is about a kitten, ‘Poekie’. I made it as an illustration for a children’s story (a product of my imagination too). Poekie is all alone, a little lost, in a dark alley. I want to show its loneliness. I want to show it’s a cute, little kitten. I want to show Poekie is not scared. It’s a courageous little kitten! 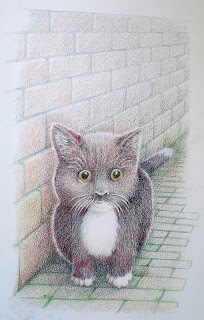 To be able to show all of this, it wasn’t enough to take a photograph of a kitten and draw it just like that. I took some photographs of kittens, to see what kittens looks like, in general. But then I used my imagination, to change some things, to add some things. Its shape became rounder, its eyes bigger, its black fur more reddish; so I enhanced its ‘cuteness’. Its pose and the look in its eyes tell you: this is a courageous kitten. And the background shows: Poekie is all alone in a dark alley. The second drawing was also made using photos. 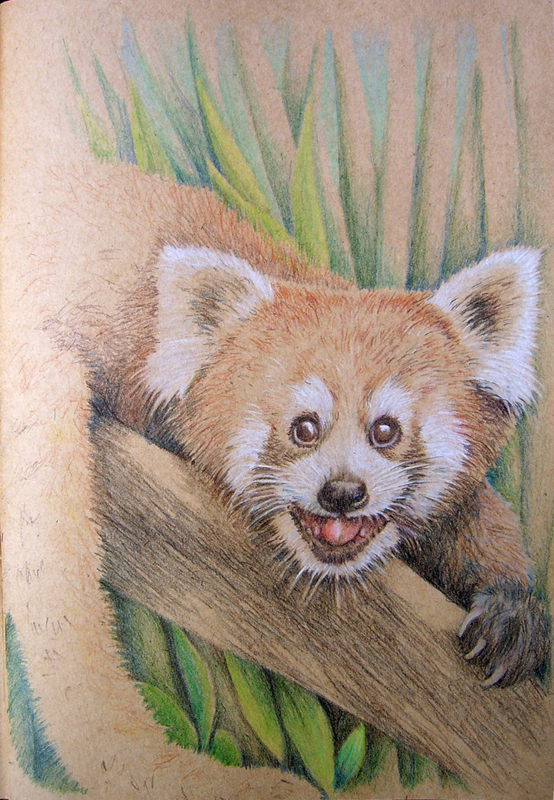 In a magazine about wildlife I saw some photos of the elusive ‘red panda’. In this case I did not change much to the ‘red panda’. I only wanted to show it’s a very cute and fuzzy looking animal. So I changed a little to its eyes and mouth and its fur. And I fitted its shape (pose) to my paper. The second way. This is ‘totally imagination’. Maybe you can call it a ‘doodle’. I took my paper and a ballpoint and started, with no idea of what to draw. My first thought was: a person. I started drawing an oval shape for the head. It was at the left side of the middle of the page. I thought: “there’s space for another person, right of the middle”. So I made another oval head shape next to it. 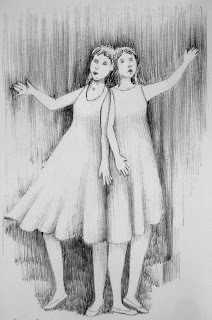 Then in my imagination came the idea of two sisters, standing close together. I made some lines to show the position of their bodies. It looked to me as if they were singing whole heartedly. I made lines showing they each had one arm spreading out. And so the whole picture developed while I was drawing it. When a shape became clearer to my mind, I made it look clearer in my drawing. I added curves and shades. So I went on until it looked good to me. Now I present to you: the ‘Singing sisters’.